Breaking news. 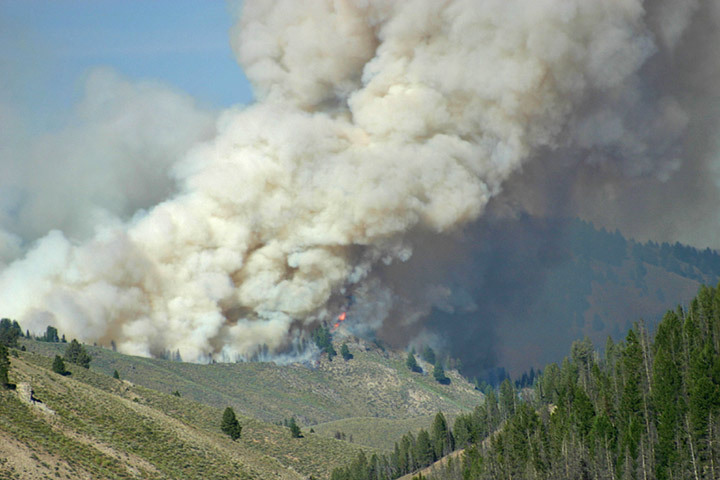 At about noon July 10 a camp fire in Basin Creek exploded into what may be a big forest fire. Under a stout west wind, the fire burned down the breaks above the Salmon River Canyon (north side) and threatened the electrical power line for Stanley. There is lots of dry fuel — dried out trees, dead trees, brush. It’s in very rough country. The fire burned out of Basin Creek and is burning on the ridge above Mormon Bend — the long curve on Idaho 75 where rocks are always rolling down onto the highway. It isn’t clear yet whether Idaho 75 will be/is closed (relevant to those coming up the canyon from the east). I hope to have photos by tomorrow. The fire has died down with the night, but will wake up again after the sun rises. The fire could jump the highway and start burning the south side of the Salmon River Canyon too. Update July 12. It looks like this one will soon be controlled if high winds stay away. Electricity is back on and Highway 75 is open. There are photos below taken by a local resident. I was told this will probably not be the last one in the area, given the extreme dryness of the forests and all the dead trees from the insects that killed the lodgepole pine trees weakened by past years of drought. 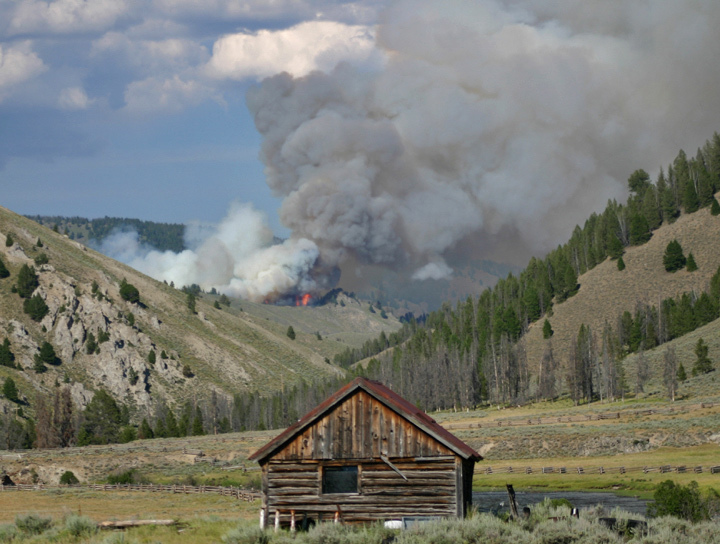 Seven miles beyond an old log cabin near Lower Stanley, flames torch old Doug fir trees on the ridge between Basin Creek and Mormon Bend in the Salmon River Canyon, Tuesday, July 10, 2007. Photo copyright Lynne Stone. Flames burn Douglas fir trees on the ridge separating Basin Creek from Mormon Bend Campground, Salmon River Canyon, 7 miles from Stanley, Idaho. Note that the vast swath of dead trees in the area is not Douglas fir, but lodgepole pine, so this fire is a bit ironic. Photo copyright Lynne Stone. Update July 13. The Basin Fire was contained at 200 acres. Added August 21. Now in retrospect, this fire was minor compared to what burned in Idaho in the summer of 2007.